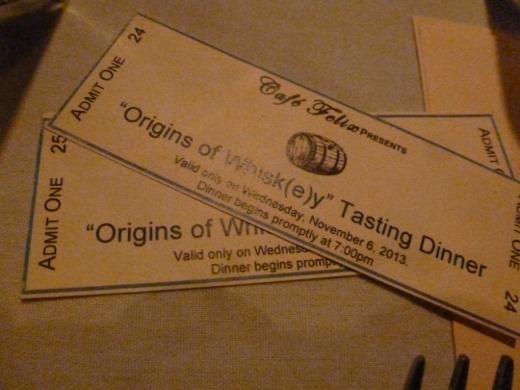 Last week I attended Café Felix’s first Whiskey Tasting Dinner. We had a lovely evening. I love the warm, intimate atmosphere. Perfect for date night with the huz. Café Felix gussied up the seating area in the rear of the restaurant for the event. 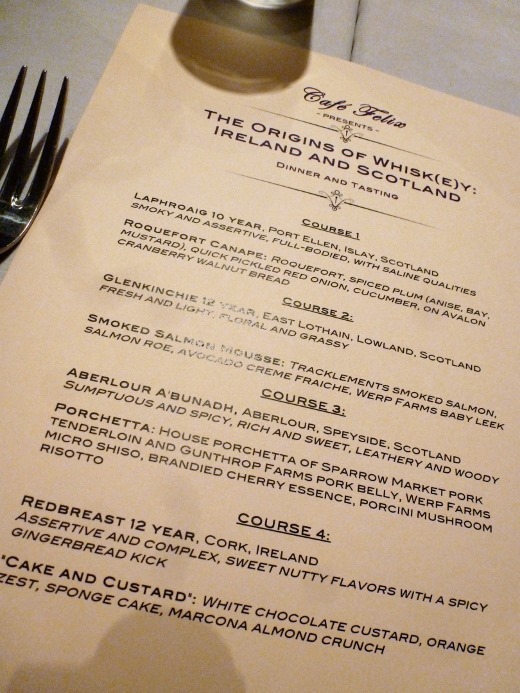 Each place setting featured an infographic explaining the whisk(e)y making process, as well as a menu for the evening. Bartender Jude Walser presented information to our group about the origins of whiskey making, and gave a brief description of each whiskey before and while we tasted it. First came the spirits, then came the food pairing, accompanied by a description and explanation of the rationale for the pairing from the chef. I should preface the rest of the post by saying that all of the food pairings were amazing and I loved every bite of food I had this evening. Oh, and the whisk(e)y was good too. 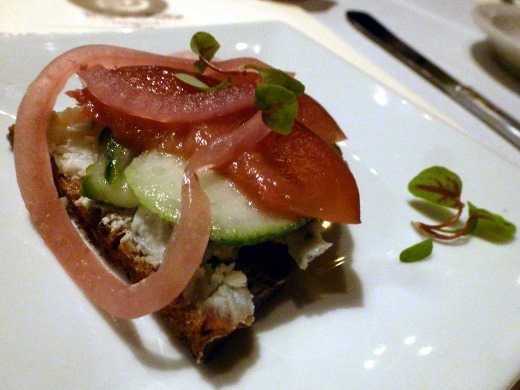 Our first course featured bold Roquefort cheese upon a local Michigan cranberry walnut bread, topped with spiced plum and quick pickled onions. The bold cheese and spiced fruit stood up well to the smoky, full-bodied 10 year old Scotch Whisky featured in the first course. 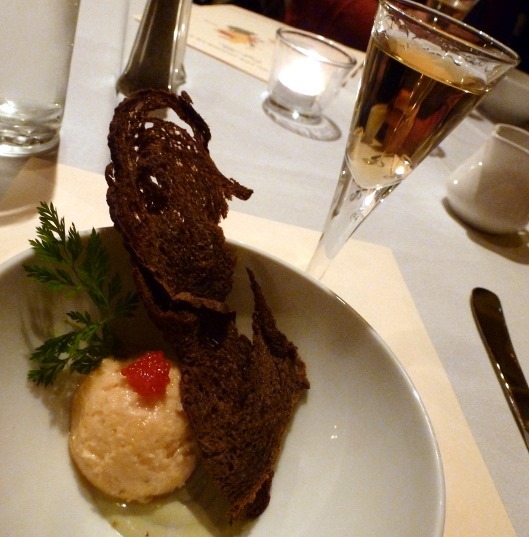 Next up: Smoked Salmon Mousse, made using Ann Arbor company Tracklements’ salmon, garnished with salmon roe, and served with a homemade pumpernickel cracker. 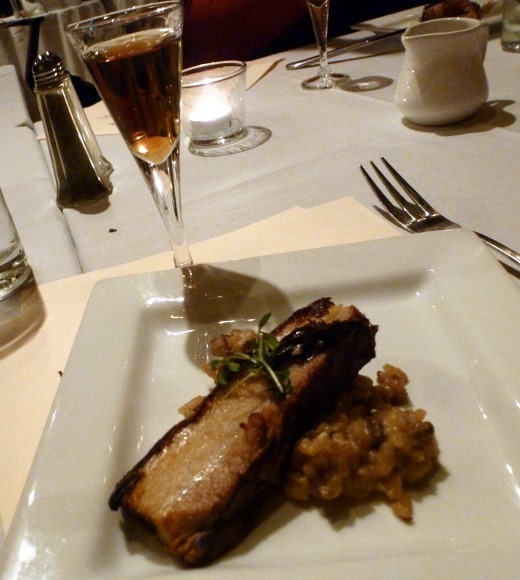 This course was paired with a lighter, floral Lowland Scotch Whisky. It took everything in my power to not lick the bowl. For the main course we were treated to rich and savory slice of porchetta atop a mound of creamy, earthy porcini mushroom risotto. The Scotch Whisky pairing was a high ABV spirit: Aberlour A’Bunadh. It was the richest whisky of the night, to me, but the burn was quite intense! 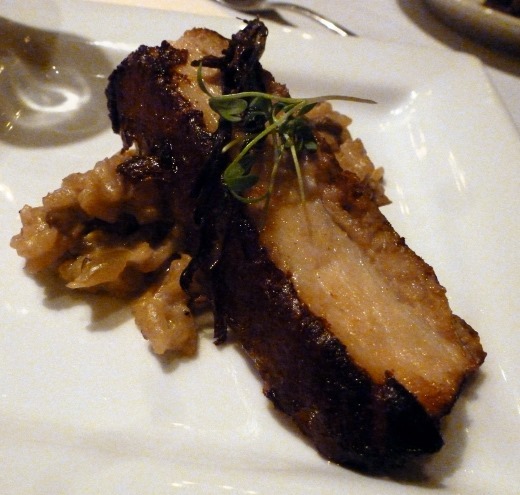 Close-up of that pork goodness. 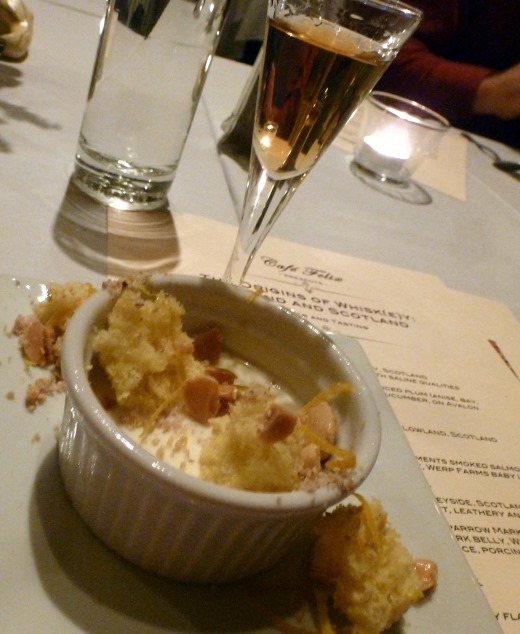 And lastly – I wish my picture did justice – we enjoyed an ever-so-luscious “Cake and Custard” dessert, paired with one of my favorite whiskies, which I’ve had the opportunity to try in the past, and was happy to see it featured this evening: Redbreast 12 Year Irish Whiskey. 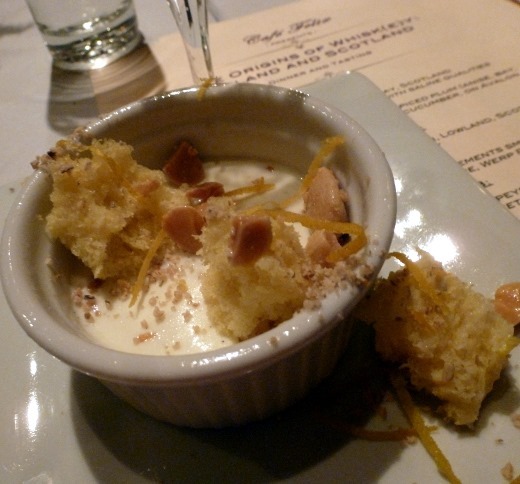 I adored the white chocolate custard, garnished with orange zest and crunchy marcona olives, served with a light orange sponge cake. Right up my alley! Couldn’t get enough of this dessert. Though I’ve only attended a few in my adult years, I have to say that this was my favorite whiskey tasting that I’ve had the chance to attend. I loved the quality whiskies that were featured as well as the incredible food pairings. I was also a fan of the format of the informative tasting. I have to say that I like where Café Felix is headed in their mission to reinvent themselves. I definitely recommend checking out their future planned monthly whiskey tastings if you get the chance. This looks amazing. I went there for lunch with a friend and we both want to revisit for dinner. 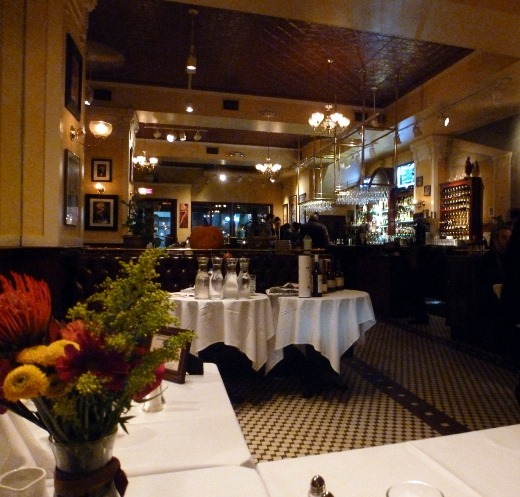 a2 needs a good straight-up French place! 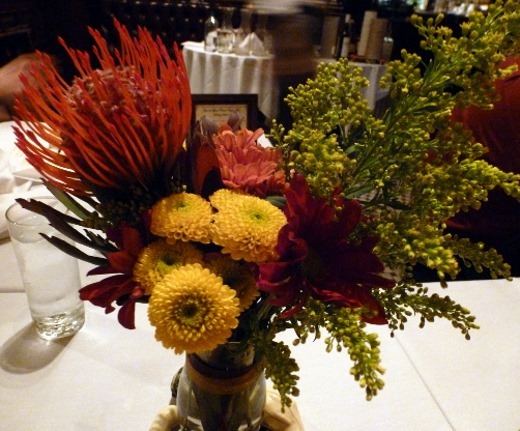 For both this event, and my last visit (Dishcrawl) I experienced really awesome food and service. I want to return for a full-fledged dinner too! 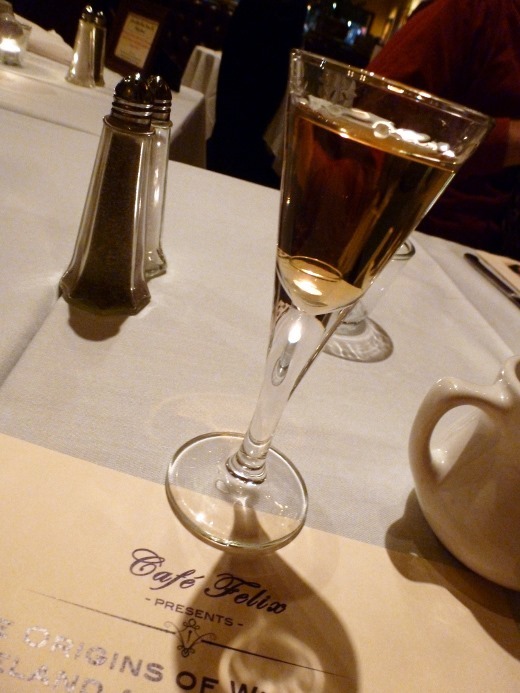 Once I started being a grown-up in Ann Arbor and going out downtown, Cafe Felix became one of my favorite places. I hope they’re doing a whiskey tasting when I’m home in late December, my boyfriend would love it! I think their plan is to hold one on the first Wednesday of each month! I love their Martini Mondays! 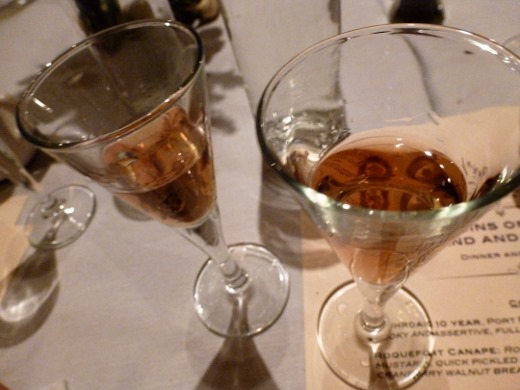 Pingback: Café Felix: Bourbon and American Whiskey Tasting Dinner | Meg.Goes.Nom.Nom.